elli & nels *in stitches*: I've been slacking!...but not really. Slacking on my blog, maybe, but in the last two days I've taped together, cut out, and/or traced 4 different patterns (and I still have two to go). I've made seemingly endless yards of bias tape. I've cut out 3 dresses, and they're waiting to be sewn up. And I have a pile of fabric hanging out on a chair in my living room, just waaaaiiiiting...I keep telling it to be patient, but it's yelling at me. There just aren't enough (working) hours in a day. My kids still want to eat and stuff. 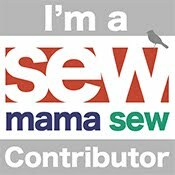 I started a "to-make" list on my KCW profile, and that's as far as it goes! Lucky for me, all this sewing prep work counts for the hour-a-day I'm supposed to be working on kid's clothes (hence the name)...cutting, taping, seam-ripping...*shudder* I'm hoping it doesn't come to that. My seam ripper and I have a love/hate relationship. Mostly hate. I would actually rather scrap a project entirely - no, wait, I wouldn't. Fabric's not cheap. Any guesses what pattern that dress is from? CCP Bubblegum, of course! My favorite! Do I have enough pink, do you think? Obviously sewing for little girls here! That must be the fabric you were talking about? You know me well (or something) it is GORGEOUS! Just the kind of thing I like, girly without screaming PINK! ;) Also, the sweatshirt posted on Facebook is simply adorable! Too cute for words! Yeah, that's it! I've cut three dresses out of that :) Thank you, that was a quick sew while Lauren was here, promised for her baby.